Not to be confused with Aston Hall, Aston-on-Trent. Aston Hall is a Grade I listed Jacobean house in Aston, Birmingham, England, designed by John Thorpe and built between 1618 and 1635. It is a leading example of the Jacobean prodigy house. In 1864 the house was bought by Birmingham Corporation, becoming the first historic country house to pass into municipal ownership, and is still owned by Birmingham City Council. It is now a community museum managed by the Birmingham Museums Trust and is open to the public during the summer months, after a major renovation completed in 2009. Using a design by John Thorpe, construction commenced in April 1618 by Sir Thomas Holte, who finally moved into the hall in 1631. It was completed in April 1635. It is now Grade I listed. The house sits in a large park, part of which became Villa Park, the home ground of the Aston Villa football club. The house was severely damaged after an attack by Parliamentary troops in 1643; some of the damage is still evident. There is a hole in the staircase where a cannonball went through a window and an open door, and into the banister. The house remained in the Holte family until 1817 when it was sold and leased by James Watt Jr., son of industrial pioneer James Watt. The house was then purchased in 1858 by a private company (the Aston Hall and Park Company Ltd) for use as a public park and museum. After financial difficulties it was then bought by the Birmingham Corporation in 1864, becoming the first historic country house to pass into municipal ownership. It was also visited by Washington Irving, who wrote about it as Bracebridge Hall, taking the name from Abraham Bracebridge, husband of the last member of the Holte family to live there. Irving's The Sketch Book stories depicted harmonious warm-hearted English Christmas festivities he experienced while staying in Aston Hall, that had largely been abandoned. An Aston Hall Christmas Eve custom the owners afforded the servants of the house appeared in The Gentleman's Magazine in 1795, which wrote, "the servants have full liberty to drink, dance, sing, and go to bed when they please." 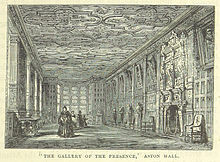 For a few years from 1878 Birmingham's collections of art and the Museum of Arms were moved to Aston Hall after a fire damaged the municipal Public Library and Birmingham and Midland Institute which shared a building in Paradise Street, until the building of the current Art Gallery in the Council House complex. Aston Hall is now a community museum managed by Birmingham Museums Trust, having previously been managed by Birmingham City Council until 2012. Aston Hall is open to the public during the summer months, following extensive renovation from 2006-2009. It boasts a series of period rooms which have furniture, paintings, textiles and metalwork from the collections of the Birmingham Museum & Art Gallery. Visible from the House less than 200 yards to the north is Aston Villa Football club stadium. The easternmost part of the grounds made way for the A38(M) motorway, also known as the Aston Expressway. This opened in 1972 and gave the city centre a direct link with the M6 motorway. ^ Historic England. "Grade I (216751)". Images of England. Retrieved 17 September 2009. ^ Chisholm, Hugh, ed. (1911). "Aston Manor" . Encyclopædia Britannica. 2 (11th ed.). Cambridge University Press. p. 793. ^ "The mystery of the headless statue". Birmingham Newsroom. Birmingham City Council. 17 January 2011. Retrieved 17 January 2011. Davies, Stuart. By the Gains of Industry - Birmingham Museums and Art Gallery 1885-1985. Birmingham Museums and Art Gallery. ISBN 0-7093-0131-6. Haywood, William (1946). The Work of The Birmingham Civic Society 1918-46. Kynoch Press. Hickman, Douglas (1970). Birmingham. Studio Vista Limited. Wikimedia Commons has media related to Aston Hall. Wikisource has the text of the 1905 New International Encyclopedia article Aston Hall. This page was last edited on 13 March 2019, at 23:47 (UTC).